Home » Convert GoPro Videos for Premiere Pro – Is It Necessary? 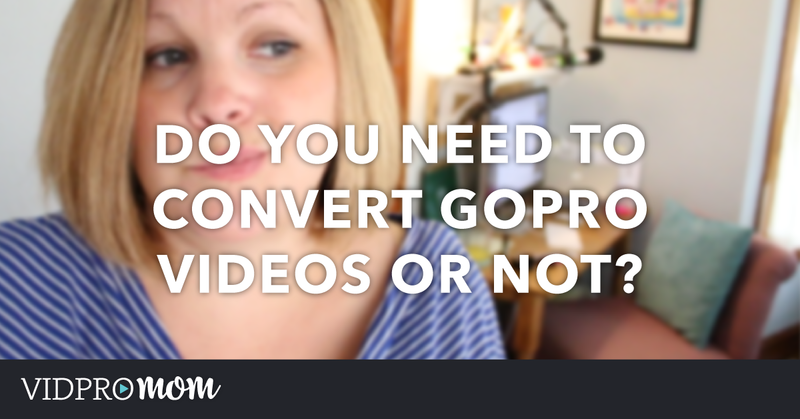 Do you have to convert your GoPro files before editing them, or can you just use your videos straight from the camera? That seems to be the mystery of the day! And I’ll be honest… I have never converted GoPro clips before editing in Premiere Pro, but since I see this question pop up a lot, I thought maybe I should check it out. And the answer is… it depends on who you ask. Thanks to a quick Google search, I found this helpful Reddit thread on the subject. The answers differed greatly there, and it didn’t really get to the bottom of it. So I decided to seek answers from the GoPro and Adobe. First of all, let’s back up a little bit in case you’re not sure what the heck I’m talking about. The GoPro files on your memory card are SUPER compressed so that you can fit all that data onto one teeny tiny little Micro SD card. And that’s a good thing! There’s a lot of data there that you can store in a very small space. All consumer‐level cameras and many professional‐level cameras record in highly compressed video formats designed to capture large amounts of data very quickly and save that data onto an SD card or other portable media format in as small a file as possible. 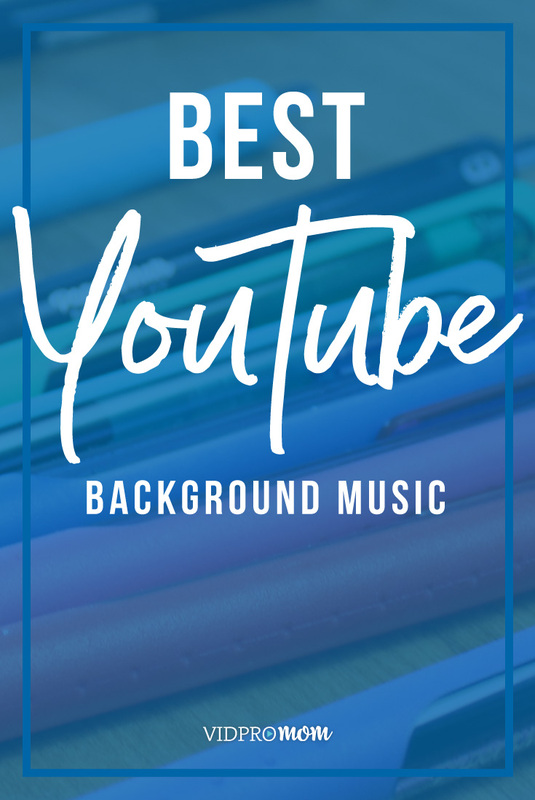 This is great for recording a lot of data onto a small space, but these compression formats are not designed nor optimized for maintaining image quality during editing or color correction processes. So, straight out of the GoPro camera, your video files are compressed. And that’s ok, they’re fine like that. If you want to shoot GoPro videos and then throw them onto an external hard drive, and not edit them or anything like that, then that’s fine. This is why converting GoPro clips is one of the first steps when editing with GoPro Studio. But what if you’re NOT using GoPro Studio? 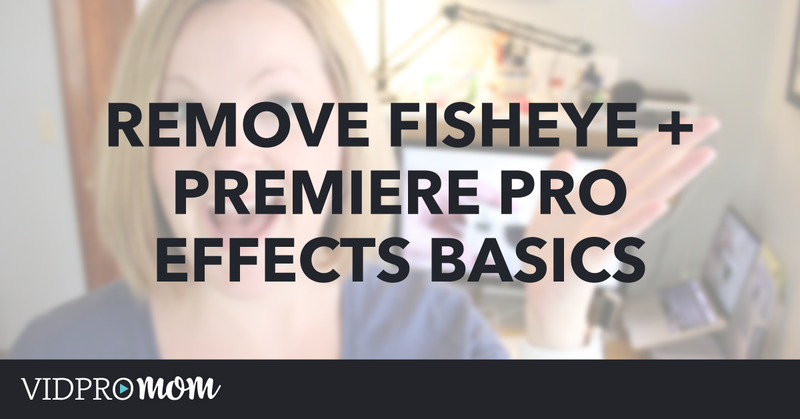 Do you still need to convert your clips before editing in something like Adobe Premiere Pro? 4K and higher? So, if I have videos that are 1080p, I don’t need to convert to GoPro’s CineForm codec? Is there REALLY a loss of quality? Is Playback REALLY jerky and out of sync? and if I’m just editing 1080p clips does converting REALLY make the big of a difference? The only way to figure it out was to try it out for myself, so here’s what I did. The first thing I did was opened Premiere Pro and started a new project. I imported my .mp4 clip to my project – the clip that would have come straight off the GoPro’s memory card (.mp4 file). Then I opened up GoPro Studio and imported that same exact clip there, and converted it. That left me with two identical clips, but different files – one .mp4 (compressed) and one .mov (converted). At first glance, in Premiere Pro, they don’t look that much different. Quality-wise, they both look great. By the way, the settings for these videos is 1080p, 30fps. Looking at the two clips side by side, I notice that the converted (.mov) file has a little bit of a pink hue to it. Very subtle, and not really noticeable unless the two clips are side by side. This isn’t a big deal at all, it’s just a matter of adjusting the white balance (easy peasy). I did notice while playing back the two clips in my timeline, the compressed (.mp4) file did get a little laggy when switching back and forth. The converted (.mov) file did a TINY bit, but the compressed file was a lot worse. The moral of the story… I will probably be converting my GoPro videos before editing in Premiere Pro from now on. 🙂 But, you should try this for yourself and see if you have the same results as I do. If you were going to edit one quick clip and not edit multiple clips into an awesome GoPro movie, then I’m sure you’d be fine to use the compressed file. Your experience will depend on your camera settings and computer specs (RAM, processor, memory card, etc.). In my video, I show you how to split your frame so that you can see your two clips side by side in the same frame. Try it out for yourself! You’ll need to import both files to Premiere Pro, and then put them both on the timeline, layered one on top of the other. Then apply a crop – 50% from the left or right – to the top layer. I also added a Title that had a line down the very center of the frame and a label on each side so I’d know which side was compressed and which side was the converted GoPro video. 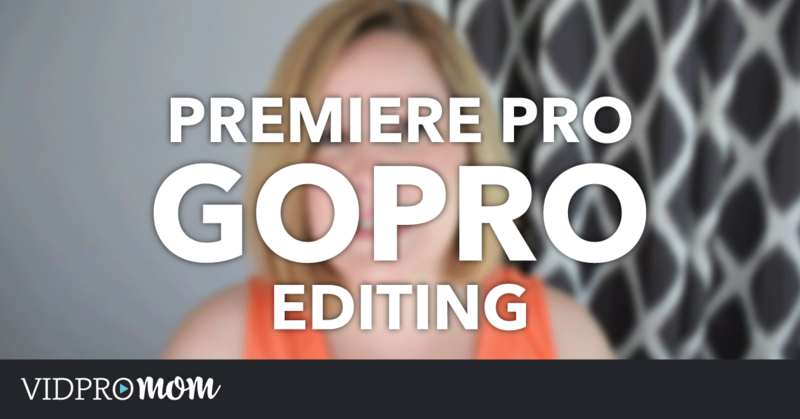 Previous Post: « Premiere Pro for GoPro Editing – Yes or No? If I may chime additional info on compress vs non-compress and why do it for color correcting in a simplified explanation. For compress video, picture in your mind a 2×2 grid that is displayed at every frame which totals to 4 data at any given time. When you are color correcting you are changing data on the image. so with compress you are only able to work with very little data for coloring. Thius you are often limited to a low range of data to color. 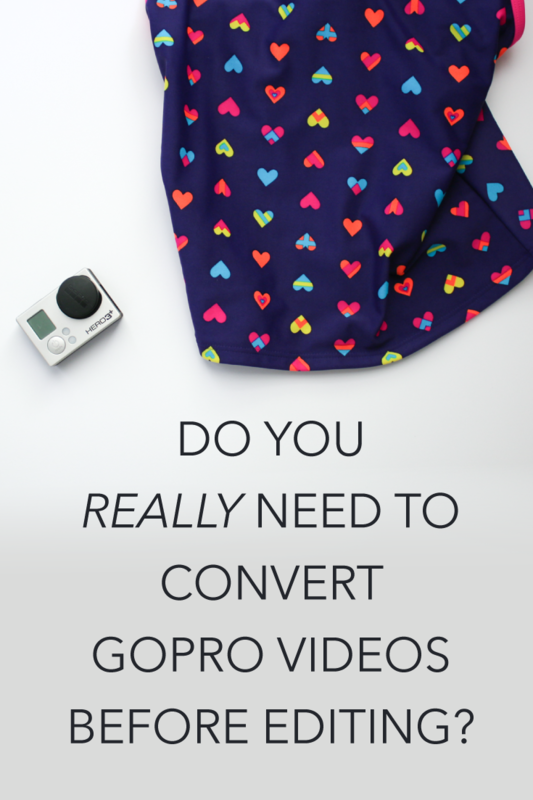 for non-compress video when you convert from compress. Now try to Picture a grid that’s 8×8. That’s now 64 data per given frame. You have more range of data to color correct and manipulate. this why un-compress file size increases and because the computer doesn’t have to decompress on play back, non-compressed video are always going to play back faster with less lag time. If you like grading your footage you’ll most likely want to work in uncompress format. Thanks for the video, I’ve been watching several as of lately. I haven’t experienced any playback issues within PP when using files straight from the camera (Hero 6 H.264 .mp4 files). I can’t however seem get a high-quality export from PP even with generous H.264 settings. The camera files look great as far as image quality but need trimming and basic color correction within PP. I try to match the export settings to match the straight-from-camera file and the export noticeably worse than the original. I know there is potential for quality loss on conversion but am I missing something here? I also tried identical edits on the same file but converted to CineForm (from Studio to an AVI) in PP, and the exports look even worse than those compared to files using straight-from-camera clips. Am I doing something wrong here or is there no way to get similar or close to quality of an mp4 straight from a GoPro camera? Hi Chris, what export settings are you using? What’s the bitrate set at? Thank you! This is super helpful. Do you have a post about how to convert from GoPro clips from mp4 to .mov? Do you have to use the GoPro Studio app to do so? You should be able to use Handbrake for that! I often use Pavtube Video Convertet to transcode GoPro CineForm video to MPEG-2 or DV AVI for my Premiere Pro.